Mark Wood : These are a Few of My Favorite Things. A compilation of the best of Mark Wood’s hard-rock violin catalogue, with highlights including previously unreleased material such as a new hip version of "Eleanor Rigby" with vocals by Laura Kaye and a smoking rendition of Jimi Hendrix’ "Purple Haze." Total playing time is approx. 45 minutes. 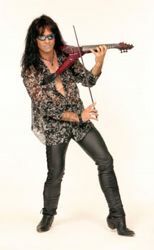 As an electric violinist, Mark Wood is a highly acclaimed international recording artist who has released six CDs of his highly original music, showcasing his unique approach to the electric violin playing on his own line of patented instruments; he has toured and recorded with many of the industry's most prominent performers. In addition to touring with Celine Dion, where he was featured on a duet with her on the song "To Love You More," Mark was also string arranger on two of her records. He was the featured violinist in Billy Joel's video "All About Soul," appeared on "MTV Unplugged" with Lenny Kravitz, and has performed with Everclear in a live special for New York radio station WPLJ-FM. In the capacity of composer, Mark started Mark Wood Music Productions, a company which focuses mainly on creating dramatic and inspirational pieces of music for television and film markets (particularly sports productions, network specials, and commercial spots) and has earned Mark a number of impressive video and audio production credits. He received his first Emmy award for music he composed for CBS-TV’s coverage of the 2002 Tour de France bicycle race, and has received three additional Emmy nominations; for music for the Winter Olympics on CBS-TV and a documentary for ABC-TV; the most recent nomination for music for the 2003 Tour de France. The client list of Mark Wood Music Productions includes many of the major television networks as well as several world famous recording artists. One of Mark’s commissions was from The Juilliard School, who enlisted him to compose a piece for their electric string quartet – “Nest of Vipers” had its world premiere in April 2003 at Lincoln Center in New York City. His concerto for electric violin and orchestra, the 15-minute groundbreaking piece entitled “Innocence to Enlightenment” had its debut in August 2003; and "Viper Vs. Orchestra" premiered at Carnegie Hall in 2007 where Mark was accompanied by the Etowah Youth Orchestra conducted by Michael Gagliardo. In early 2008, Mark was elected to the board of the American String Teachers Association (ASTA), where he will have the opportunity to affect the future of progressive string education in our country on a truly grand scale. And as educators across the country are quickly catching on to the importance of incorporating alternative teaching methods into their curriculum, Mark’s “Electrify Your Strings” series of music education programs have become enormously successful and in demand. EYS has really captured the media’s attention and has been featured on several national broadcasts of CBS Evening News, along with segments on ABC-TV, NBC-TV, CNN, and many others. EYS has been brought to over 100 schools in the US, including the Berklee School of Music, The Juilliard School, Oneonta University, The Rock & Roll Hall of Fame, and many others. In addition, along with such formidable colleagues as Arnold Steinhardt of the Guarnari String Quartet, Isaac Stern, and Yo Yo Ma, he is an instructor of a special course at the annual Mark O'Connor Fiddle Camps held in Nashville and San Diego. Click the button below to add the CD, Mark Wood : These are a Few of My Favorite Things to your wish list.